Das nächsten Meetup der Gruppe Impact of Science beschäftigt sich mit dem Thema ‘Understanding the impact of science’. Paul Wouters, Professor für scientometrics und Co-author des Leiden Manifesto, sowie Gert G. Wagner, ehemals Leiter des Deutschen Institut für Wirtschaftsforschung (DIW Berlin) und Vorsitzender des Sozialbeirats werden mit kurzen Vorträgen das Thema beleuchten. Wir freuen uns auf eine rege Diskussion, um Anmeldung wird gebeten. Scientists are increasingly asked to foster the societal impact of their research. But what exactly do funders, policy makers, and the civic society mean by societal impact? What are ways to foster it and what are risks and challenges? These questions will be at the core of our next meetup ‘Understanding the impact of science’. We are honoured to welcome two of the core thinkers on that topic: Paul Wouters, professor of scientometrics and co-author of the Leiden manifesto, and Gert G. Wagner, former head of the German Institute for Economic Research (DIW Berlin) and chair of the German Social Advisory Council. The number of seats is limited, RSVP now to reserve your slot. What do we mean by the societal impact of research and what are ways to foster it? Paul Wouters is Director of CWTS and Professor of Scientometrics. His is specialized in development of evaluation systems and how these systems are creating new constraints for the development of knowledge. He is also interested in the history of science in general and the role of information systems in these histories in particular. Earlier in his career he has worked as science journalist and as editor-in-chief of a daily newspaper. What is good scientific policy advice? Gert G. Wagner is Professor of Economics at the Berlin University of Technology (TUB), member of the Executive Board of DIW Berlin, Max Planck Fellow at the MPI for Human Development (Berlin), member of the National Academy of Science and Engineering (acatech) and Associate Researcher at HIIG. Since 2014, Prof. Gert. G. Wagner has been a member and chair of the German Social Advisory Council. If you would like to present your project in a 2-minute lightning talk at the end of the event, your are welcome to do so. And as always, there will be time to mingle with snacks and drinks on the HIIG terrace afterwards. 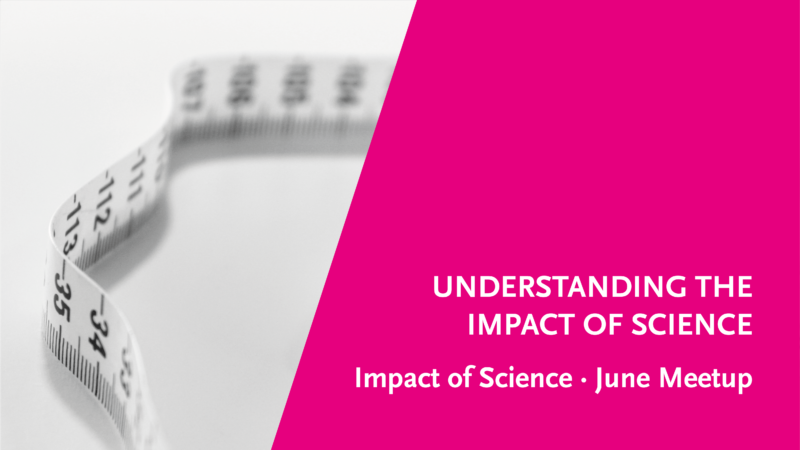 This meetup is part of a regular series on the impact of science jointly organised by Alexander von Humboldt Institute for Internet and Society (HIIG), Impact Distillery, and Elephant in the Lab. There is a pressing need for informed expertise from virtually all fields of academic research. Still, scientific expertise often remains within its own domain and only reaches relevant decision-makers in civil society indirectly and belatedly. The prevalence of citation metrics to measure scholarly impact often compels researchers to focus on article publications in disciplinary journals. Prominent policy makers and research funders therefore increasingly place the question of societal impact at the top of their agenda. The event series aims to create a platform for experts and the interested community around Open Science, Knowledge Transfer and related topics. In short talks we will invite experts to shed light on the exchange between politics, business, media and academia. Individual meetups will explore disciplinary particularities and innovative formats of knowledge exchange. Join the discussion and stay tuned by signing up to the meetup group!